October 5, 2011 - After thorough analysis of the content and implications of the resolution of the Tribunal de Defensa de la Libre Competencia de Chile (TDLC), Chile’s antitrust court, regarding the merger process between LAN Airlines and TAM, the Boards of Directors of both companies have confirmed their decision to move forward with the transaction. LAN and TAM believe the mitigation measures imposed by the TDLC do not significantly impact the synergies generated by the transaction and do not modify in any material respect the companies’ joint strategic development plans. From the analysis, the estimated impact on the expected synergies would not exceed US$10 million per year, reducing by such amount the total previously announced synergies of US$400 million. The mitigation measures considered in the judgment by the TDLC are broadly in line with the measures that LAN and TAM were prepared to accept in January 2011 in the out-of-court settlement negotiated with the Fiscalía Nacional Económica (FNE), Chile’s antitrust authority. 3. The fourteenth condition, which provides excessive intrusive powers to the FNE and to the consultant that the TDLC requires the company to hire to collaborate in the surveillance process. The company considers that the proposed “unrestricted, total, permanent and continuous” access that this consultant would have, both in and outside of Chile, to LATAM Group’s data bases, systems, accounting, installations, offices, call centers and others, is unlimited and differs from what is provided for by law since it lacks previous judicial controls and is therefore illegal in that it affects constitutional rights. In its appeals before the Supreme Court, it is highlighted that the seventh and fourteenth measures have legitimate legal and constitutional alternatives which are in accordance with the underlying spirit of the measures proposed by the TDLC. LAN and TAM confirm their commitment to implement the merger in the shortest possible timeframe, which they expect to be towards the end of the first quarter 2012. It is important to highlight that LAN and TAM plan to move forward, in parallel with the Supreme Court appeal process, with the various regulatory and corporate authorizations that are still required to complete the transaction. LAN Airlines is one of the leading passenger and cargo airlines in Latin America. The company and its affiliates serve over 76 destinations around the world through an extensive network that offers full connectivity within Latin America, while also linking the region with North America, Europe and the South Pacific, as well as 93 additional international destinations through its various code share agreements. 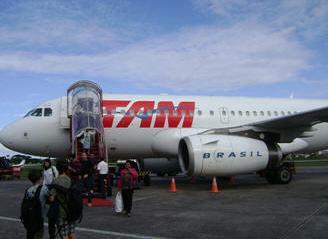 TAM, including Pantanal, operates direct flights to 45 cities in Brazil and 18 cities in South America, the United States and Europe. Through agreements with companies in Brazil and abroad, TAM's network encompasses a further 92 airports in Brazil and 92 international destinations, including Asia.